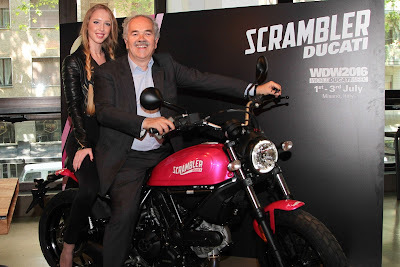 Renowned Italian motorcycle manufacturer, Ducati surprisingly launched a special Scrambler shocking motorcycle models for the ladies bikers, but this bike does not have a significant difference with the mounts of men in general. The thing that distinguishes the motorcycle was just a touch of color given on motorcycle is synonymous with the character of the woman who became an offer target from the Italian manufacturer. Shown in pink or so-called pink, Scrambler Ducati launched specifically to women consumers. 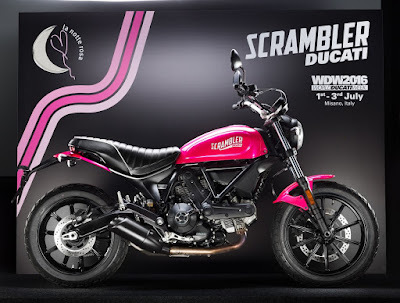 As quoted from Autoevolution, in his official statement mentions manufacturer Ducati Scrambler launch the color pink because the color is a lot like a woman. Scrambler models named Sixty 2 will use a small capacity engine is 399 cc is capable of spraying power up to 41 hp. In addition to setting up a small capacity engine, Ducati also reduce the weight of classic motorcycles for women have become much lighter. In addition to preparing the colors pink, Ducati also plans to offer a selection of Sixty 2 with the general color that could be a collection of all Ducati customers worldwide.